The Stanley Cup is the hardest trophy in sports to win. It is even harder to win in back-to-back seasons. It is the NHL's two best teams left standing in a best of seven series and it is fool hearty to think that such an event would end quickly or that wins would come easy. These are facts most hockey fans already know but needs repeated over and over until it finally sticks. With only three games remaining in the Stanley Cup Final, the Pittsburgh Penguins once again hold their own destiny in their hands. The Penguins succumbed to the rotten seafood smell of the the Litter Box Bridgestone Arena and now find the series tied at two games a piece. Over the past four games, there have been so many bits and pieces of information, hot takes from fans and media alike, and blaring observations regarding each game flying around in which to touch on it would take numerous posts just to cover them all. I have decided to take some of the more interesting topics in which to elaborate on today. Please keep in mind that my name is not Willy Wonka and you will find no sugar coatings on anything here. Item 1: Nashville is quickly climbing the ladder of "most obnoxious fan base" and are dangerously close to over taking the second spot reserved for Washington Capitals' fans. It is completely understood that this is a shiny and new experience for them. Any fan base would be overjoyed. It is fantastic that they can get that loud in their arena. However, the fish flinging, the smash car, the awkward country music stars cheering in the stands, and the overdone chants have become old very quickly. All of which are now more of an annoyance than anything else. It is a great thing that Nashville wants to become a true hockey town and perhaps they can be once the focus becomes more about the game and less about parties, celebrates, bars and redneck past times. It makes others wonder if the enthusiasm will be sustained when/if the Predators meet their eventual end. Item 2: Stop complaining about the officiating- it isn't going to change. Whether fans like it or not, the officiating has hit an all time low and it isn't about to get any better. Gary Bettman can beat his chest and say whatever he wants regarding whether or not the NHL allows their referees and linesmen to dictate games however, the eye test doesn't lie. There is no sense complaining about it on social media any longer as it has become quit clear that the NHL governing body could care less about it's players and their overall well being. Save your energy my fellow Twitter peeps. It is better spent elsewhere. Items 3 and 4: Crash the Net/ Put bodies in front of the net! Since the definition of what goalie interference is seems to change from game to game, it should be of great importance for the Penguins to quite literally crash the net. Come at the Nashville net minder with force and speed to try and get him rattled. 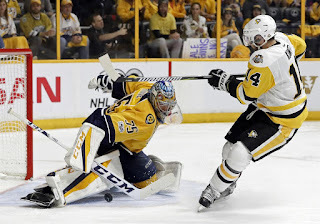 In the same mind set, the Penguins should put every body that they can in front of the net for second, third, even fourth attempts at putting a puck past Pekka Rinne. There have been more than a handful of scoring opportunities off rebounds in front of Rinne, but no one there to pick them up after the initial shot. The Penguins have players who have made a living by living just outside the crease (Hornqvist, Rust) but have, for the most part, been non-existent in two games. Item 5: Who the goalie is will not matter if the Penguins cannot score or give defensive support. There will come a day where fans on both sides of the Murray/Fleury debate will have to eat crow. That day will come sooner rather than later but for now, we look at the present. The present is this: Sullivan made his choice as to who the number one goalie is and will do what he thinks is best for the team. If you would like to challenge him for the coaching position because you think you know better, feel free to contact the Pittsburgh Penguins front office and set up an interview. Murray is the guy until HCMS says otherwise. Could he make a goalie change for game five and beyond: yes! However it will not matter who is between the pipes unless the Penguins can get a handle on giving their goalie some support. This means pressuring the forwards, getting the puck in deep at the other end of the ice as quickly as possible, and stop turning the puck over at the blue line and in the neutral zone. It is now a best of three game series with the Penguins garnering two home games within. Whatever will be will be and no matter the outcome, most of us still have to wake up and go to work the next day. The day after a win just makes for a little bit of an easier wake up. 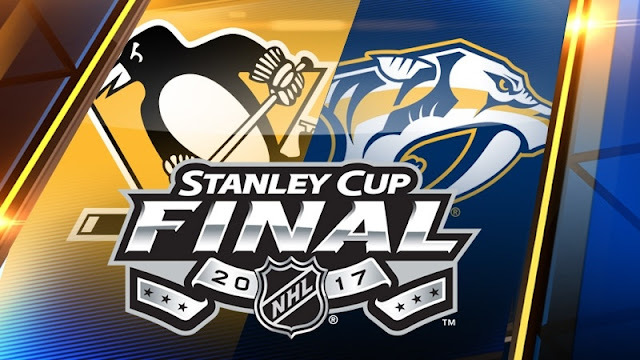 Pivotal Game five is Thursday night, June 8, back at PPG Paints Arena.